Pinterest has an entire 369-pin hashtag dedicated to creative direct mail marketing, and for good reason. While e-mail can often have a one-dimensional feel, direct-mail marketing is something clients can feel, see and touch, which holds many opportunities for the right company that’s feeling an outside-the-box approach. The initial objections to going beyond the standard direct mail postcard or other mailer (which definitely still have their place in the Atlanta direct mail marketing world) are often concerns about costs and then on return on investment (ROI). 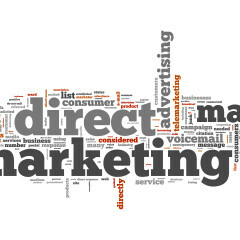 The cautious direct mail marketer should take these facts into account, however, that were revealed in a February 2015 article from the Advertising Specialty Institute: One, that people prefer to receive direct mail over any other advertising medium and two, that direct mail costs per lead are roughly the same as e-mail and pay-per-click advertising. Folding a direct mail piece in an intricate and eye-catching manner is one way companies call attention to their direct mailers. One company utilized a uniquely folded annual report that could be opened up from different aspects to review the company’s growth and projections for the year. From accordion-style to origami-like folding, there are many techniques businesses can utilize to make folds work for them. Sometimes giving a recipient a creative task to complete can more fully draw him or her into an advertiser’s mailer. One example is a mailer that is an envelope whose contents include a baggie full of puzzle pieces. When the puzzle is assembled, the recipient can read the advertiser’s message. Another advertiser sent along a mailer envelope with a seemingly blank poster inside and a carbon-copy-like sheet material on the opposite side. When the user ran his or her hands up and down the poster, imprinted words appeared, reading “The Future Belongs to The Few Of Us Still Willing to Get Our Hands Dirty.” When directed to the right customer, this makes for pretty powerful messaging. Sending along stickers or even flipbooks are two additional activity-driven mailers. Some advertisers also send along a pair of 3-D glasses the recipient has to put on in order to see the message contained within the mailer. While companies may not wish to spend their precious advertising dollars on an unknown customer or new lead, they may want to retain a customer using a gift, giving strategy. One company sent its clients Christmas-Teas, a pop-up box that appeared to have small Christmas trees sticking out of it. When the recipient lifts up the box, it is revealed that the Christmas trees are actually Christmas teas or tea bags. Another gift-like direct mailer is a magnifying glass the user can continue to use, but that also enlarges the advertiser’s mini-message for easier reading. Additional useful items can include matchbooks and even the standard coffee mug. Each of these gifts has lasting advertising capacity because ideally the recipient will keep the item and show it off to co-workers or family for some time to come. Data from the research company Competiscan found that direct mail has shown increases in custom acquisition rates, particularly within the financial services sector. The millennial generation represents those born between the years 1980 and 1999. They currently represent consumers in a highly sought after target demographic market of between the ages of 20 and 39. This news may come as a surprise to some Atlanta advertisers, as the millennial generation is often considered one that prefers to communicate or view advertisements via e-mail and on the computer only. The study found that companies in the financial services sector, such as banks, credit card companies and investment firms, are also increasing the amount of direct mail sent to millenials. In 2014, financial service businesses sent an estimated 10 percent more direct mail to millenials than they had in 2010. Financial companies are seeing the growth opportunities for this market as an estimated 40 percent of their direct mail efforts are directed at this key age group. One of the reasons why the financial sector is increasingly utilizing direct mail marketing efforts is they have found ways to integrate e-mail and online marketing campaigns more seamlessly with direct mail marketing opportunities. The messages are also directed at an audience that may not download an app, but instead prefers to conduct their financial business in a face-to-face environment. For example, many advertisers opt to give clients a unique computer link to information about a particular special offer. This allows the advertiser to track just how many customers are paying attention to the mailer and acting on it. Other companies use direct mail to highlight all of the different ways a person can complete a credit card application. This includes via phone, smartphone or in person to apply for a credit card. Direct mail serves as the key that unlocks the door to a potential customer acquisition. The direct mail advertisement introduces a particular theme, product or development, then gives the recipient the opportunity to explore other more common and comfortable methods of communication, such as e-mail. Even if a recipient does not make immediate use of a particular offer, they have started to familiarize themselves with a company’s branding and product. The next time they see this logo or offer, they are more likely to recall the company and its purpose. Millenials’ and advertisers’ utilization of direct mail has shown that sometimes the oldest methods of advertising remain the best. Even for a technology-friendly generation, direct mail still has power and usefulness in getting media messages through. Millenials also have a relationship to direct mail that they may not feel with e-mails or digital advertising communications. Millenials find direct mail to be more reliable and less intrusive than an e-mail clogging their inbox. According to a 2012 study from the research firm ExactTarget, people of all ages said that direct mail does not seem as improper as a cold call or other unsolicited message. If you have approached your 2015 direct mail marketing strategy the same way you did 2014, 2013 and beyond, it’s time to think differently. Here are four new strategies to take in 2015 that will greatly benefit your direct mail marketing campaigns — and your profits. If you were speaking directly to a repeat customer and a new customer, you would likely use different messages for each. One needs education about your business to gain their interest while the other needs to know what’s new or innovative they can take advantage of. 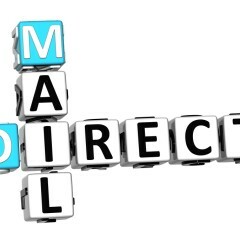 You have to view your direct-mail marketing approaches the same way. This begins with how you make and manage your list. For 2015, improve your messages by dividing your list into three segments: current, past and future customers. You must then direct your mail messages accordingly. When it comes to direct mail, e-mail and other advertising forms, it’s easy to take an “us versus them” approach where only one approach will do. The truth is, that integrating these techniques will strengthen your message overall. Even if it’s colors, a tagline or a special offer, you can use direct mail as a multiple-touch opportunity to reinforce or introduce a message. While a direct mail coupon or special offer may seem compelling to you, how do you know the direct mail is compelling to your audience? The answer is that you ask them. This principle can easily tie back in with the integration concept. Perhaps you launch your e-mail campaign first. You can come back a few days later and poll your subscribers on if they received your first message and how they may have responded to it. Or you can simply use click-through’s and purchasing responses to help gauge its efficacy. Now you have information at your fingertips. If the message was effective, great. 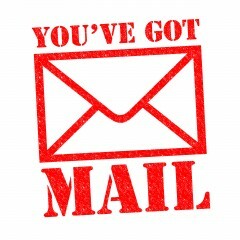 You can continue your direct mail campaign. If not, consider re-tooling your messaging. Perhaps you can make it more focused on a certain segment or consider a slightly different offer that has proven effective in the past. Another approach is to move up your call to action or make it more prominent in a direct-mail piece. Learning from your audience and using them to guide your direct mail is much more likely to equal success. Direct mail is an investment — do your mailers reflect this? One of the worst things an advertiser can do is send out a piece of direct mail that looks inexpensive or cheap. While your goal may be to save your customers money, scrimping on the advertisement that will get them in the door is not the way to accomplish this. There are many ways to create a stand-out direct mail piece that makes an impression — and just as many ways not to. Evaluate your approach and consider other options available to you, such as switching up a postcard for a direct mail package with a letter. Fulton County Direct Mail Company Better Letter Asks Is Your Call to Action Clear? Without a clear call to action, your direct mail campaign is unlikely to be successful. You must explain to recipients what they are expected to do if they are interested in your product or service. They may have to telephone to make an appointment, access your website, or visit your store. No matter what you want them to do, you must be sure to be explicit in your direct mail advertisement. You know what steps you want your audience to take after reading your advertisement, so don’t be coy about asking them to take action. It is not enough simply to list your website address or telephone number in the communication. That will do little more than raise brand awareness. If you want to generate new business, you must clearly state the steps that your prospective customers must take next. Ideally, you want your prospective customers to act immediately on reading your advertisement. The longer they wait, the less likely they are to call you, visit your website or come to your store. You can create a sense of urgency in your call to action by asking recipients to “call today.” Alternatively, you can include an offer or discount that has to be redeemed within a specific timeframe. You can include a call to action at several points in your direct mail. It can be stated in the opening or closing paragraphs of your letter, as a P.S. at the end of the communication, in a highlighted box inserted beside the main body of text, or in bold text in the body of the letter. You should take some time to consider which locations will work best in the context of your advertising copy. You may want to include several calls to action in different locations. In reality, few recipients will read the entire communication. Including a call to action at the beginning of the communication can be vital to attract the attention of prospective customers who merely glance at the first few paragraphs. Including a call to action at the end can be useful as customers may skip there to find out what to do if they are interested in your offer. Having a clearly stated call to action will increase the response rate from your direct mail campaign. It is worth spending time crafting an explicit, unambiguous call to action to ensure that customers know what is expected of them and are compelled to take action. What Makes Better Letter Direct Mail Company Douglasville GA Better! The personal level of service that every customer receives is what really sets Better Letter Mailing Services apart from other direct mailing companies. Their quality of service, their understanding of USPS rules and regulations, and their understanding of the direct mail industry is second to none. Better Letter holds themselves to the highest level of proficiency. And that level of proficiency stays high, no matter how large or how small the direct mail campaign is. Mistakes are not an option at Better Letter. Better Letter processes each and every job with extreme caution and carefulness. When it comes to creating and managing direct mail campaigns, Better Letter meticulously ensures that everything is done right the first time, and every time. Better Letter knows that every direct mail campaign is time sensitive. Whether or not the mail piece is promoting a special dated event or has an expiration date on the offer, it is still imperative that the mail piece hit at the correct time. Therefore every mail processing job is “Priority One: Mission Critical” as soon as it hits the production floor. 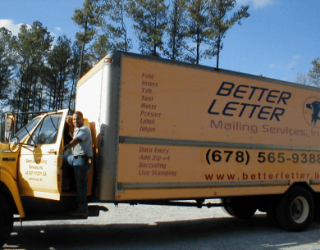 Better Letter is known throughout the Atlanta business community for getting all of their direct mail marketing jobs done quickly, and done on-time… every time. 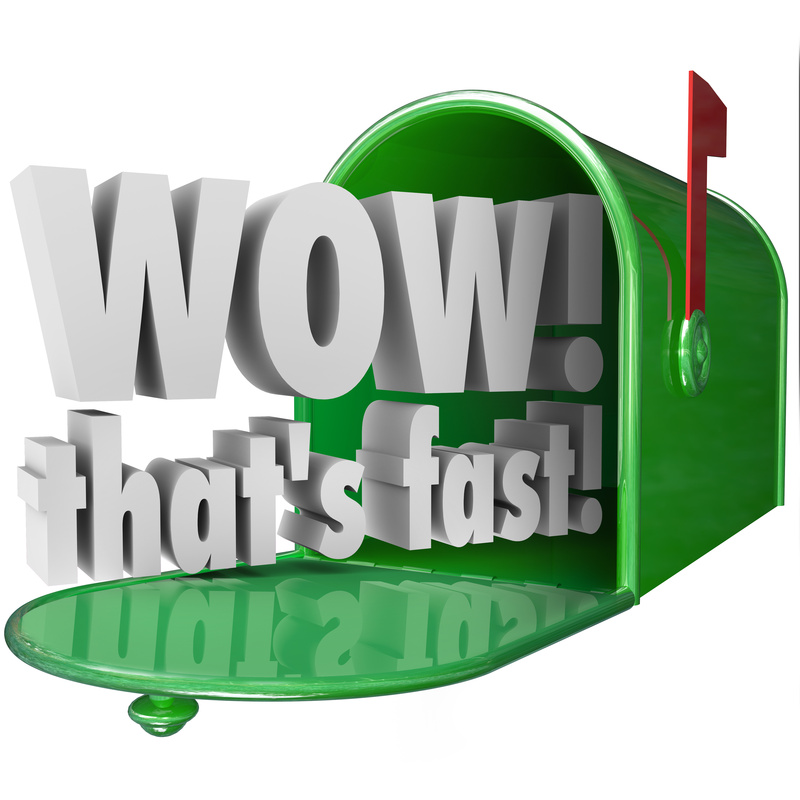 Timeliness is always critical in the direct mail industry. No one knows this better than Better Letter. Better Letter is also known for being able to handle urgent mail projects that have to be processed quickly and with little or no advance notice… RUSH JOBS. Also, if you started processing a direct mail campaign at another mail house and the job has gotten messed up and behind schedule, give Better Letter a call. They can usually take mail jobs that have been derailed somewhere else and fix them so that they can now be entered into the U.S. Postal Service mail stream. In fact, anytime you’ve got a mailing emergency, call Better Letter. Calling Better Letter is like calling 911. Better Letter’s expert consultants are available every day to make sure that your mail campaign is processed properly, expertly, and in compliance with all of the USPS standard mail preparation requirements. Better Letter’s CASS Certified and PAVE Certified software systems and their USPS bulk mail processing expertise, ensures that your mailings receive the maximum presorted postage discounts on every mailing. Those discounts belong to you. There are many advantages to letting Better Letter handle all of your graphic and printing services, in addition to handling your mailing services. The biggest advantage this gives you is that we have a full-time mail piece design analyst on staff in our graphic arts department. He can make sure that all of your mail pieces are designed and printed to meet all of the mail piece design criteria imposed by the U.S. Postal Service. Because we are a mailing service, many of our customers send us mailing projects that have been printed elsewhere. We are happy to process all of your mailing projects, regardless of where they were printed. However, sometimes those mail pieces show up unexpectedly on our dock, and once we inspect them it is clear to see that they violate one of more of the U.S. Postal Service’s Bulk Mail acceptance criteria. When that happens, the customer usually ends up having to pay more in postage. When your mail piece is not designed and printed properly, it may not qualify for the lower discounted rates, or worse yet, it may be deemed “un-mailable” and have to be reprinted. If we design and print your mail piece, then you know it will be correct every time. We pride ourselves on providing you excellent mailing services. 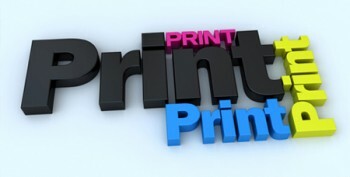 But as a full service lettershop, Better Letter also has the capability to handle all of your printing needs as well. Our full-service print shop can handle everything from letters, envelopes, and postcards, all the way up to full color brochures and catalogs. If you have any questions about mail piece design, or if you would like us to bid on your next printing job, please do not hesitate to give us a call. We will help you any way we can. If you have an idea for a direct mailing project that you are considering, and you would like to get some idea as what it may cost to print and process, do not hesitate to call Better Letter. We would be delighted to put together a cost estimation for you at no charge. If some of the variables change, just let us know and we are happy to update your price quote to the most current mailing scenario at No Charge. We work for you. We serve the entire Metro Atlanta area. If you have mailing materials that you need dropped off or picked up at your location, that is no problem. Just give us a call and one of our friendly drivers will be out immediately to assist you. Instead of giving up your precious office space to warehouse mounds of mailing material. Just keep it here at Better Letter. In fact, if you are using an outside vendor for printing, just have your materials ship directly to Better Letter. We will warehouse it here for you until you are ready to mail. No problem whatsoever. Just let us know what it is coming our way, and we will receive it, inventory it, and warehouse it. His direct email is: mailman@betterletter.biz His door is always open. Feel free to contact him anytime you have a concern. In a world where your potential and existing customers are bombarded with multiple marketing messages on a daily basis, it is vital that you do all that you can to ensure that your direct mail campaign catches their attention. Simply sending a standard letter in a plain envelope may not be enough to entice your prospective customers to purchase your products or services. Big brands that can spend thousands of pounds on creative consultants may be able to pull off spectacular direct marketing stunts, such as the cardboard record player sent out by Griffiths, Gibson and Ramsay Productions, a Vancouver-based sound engineering company. However, it is possible for small businesses to stand out be being creative and innovative in the design and advertising copy used in their direct mail campaign without exceeding their budgets. Over the years, consumers have become increasingly sophisticated. Many of them understand the way that marketing works and are alert for sales-speak. It is essential to be aware of this level of sophistication when pulling together your design and advertising copy for your direct mail campaign. Cheesy headlines such as “FREE MONEY” or “GET RICH QUICK” are likely to find their way into the garbage simply because the overblown claims are not believable. Take time to create innovative copy that will stand out from the crowd. For example, purposefully underselling your service in a quirky way could have customers keen to find out more. One way to engage potential customers is to involve them in solving a riddle or answering a question. For example, you could use the outside of your envelope or one side of a postcard to pose a question related to the service you provide. When you indicate that the answer can be found in the letter inside or on the reverse of the postcard, you can entice the recipient to continue reading to find out more. Keep the brain teaser or riddle a little bit challenging and as interesting as possible for maximum effect. Attractive and quirky visuals can engage customers more quickly than words. By using an unusual image or presenting a visual brainteaser, you can grab the recipient’s attention and have them keen to find out more about the products or services on offer. 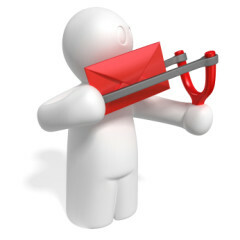 The mailboxes of your customers are stuffed full of mail that is competing for their attention. By being creative and innovative, you can ensure that your direct mail reaches the top of their must-read pile. Customers love to get a bargain. One way of helping them to achieve this is by providing coupons that enable them to claim money off your product or service. Each coupon can be given a defined value, which is deducted from the purchase price. Alternatively, you may offer a discount based on a percentage of the purchase price. The approach that you take is likely to depend on the type of product that you offer. If a customer is offered a discount coupon, it can encourage him to try shopping somewhere new. The thought of receiving a bargain can entice customers to risk leaving their usual supplier. His search for a great deal gives your business the opportunity to impress him and turn him into a repeat customer for your own products or services. Loyalty can be encouraged through targeted coupons sent out to customers for products or services that you know they will be interested in. 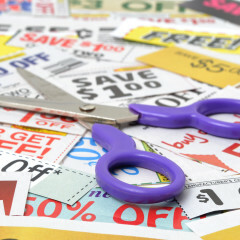 Businesses may be wary about offering coupons because the discount will cut into their profit margin. However, many customers will pick up additional items when they shop with you and, if you turn them into a repeat customer, their value over time will outweigh the discount offered. It is possible to provide customers with online coupons, either by email or through your website. However, the 2K14 Shopper Marketing Report produced by Valassis reveals that customers prefer to receive coupons in a printed format. This preference holds true even for young consumers in the 18 to 36 age bracket. Known as Millennials, these young consumers tend to be digitally savvy and are able to download information onto a range of devices, including smartphones and tablets, giving them many more options for receiving marketing material. The study shows that Millennials are more likely to prefer online coupons than any other age group. Within this age group, 47% of respondents preferred to download coupons from the internet compared to the overall average of 30%. However, Millennials are just as happy with coupons clipped from a newspaper, with 52% of respondents in this age group preferring this option. Coupons received by direct mail were preferred by 61% of Millennials, making them the most popular option for this age group. Discounts can help you win new customers and generate loyalty among your customer base. Sending out coupons by direct mail will help to increase the usage rate, even among younger customers. Direct mail will help to ensure that your coupon campaigns are an effective marketing tool. 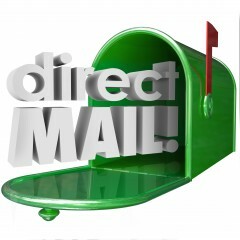 Call Better Letter for the BEST direct mail experience! We don’t often think of mail as a brand builder, but it is. First of all, let’s talk about metrics. Metrics are crucial to the success of any direct mail campaign, especially in a city like Atlanta, GA. A little forethought about the goals will ensure that your direct-mail campaign is a major success. Planning is everything. Define the criteria for measuring success by tracking cost per lead, response rate, and ROI. Newly acquired prospects are always better. Warm leads are always preferable to cold leads. Has the prospect purchased recently? Good! Then this lead is warmer than just information seekers and cold leads. If you are buying a mailing list, always make sure that the data you pay for is recent, de-duped, cleansed, in compliance with all pertinent legislation, and flourishing with opportunity for the unique requirements of your business. The personalization of the salutation of any direct mail letter is the best way to achieve a higher response rate. Further personalization, by integrating the customer’s name as well as other personal statistics throughout the copy, will tailor your offering to reflect the prospects current purchasing habits and patterns. One-to-one personalization translates directly into much higher response rates and ROI. Putting information personal and pertinent to them only makes your mail piece look more like correspondence, instead of looking like junk mail. Optimize the design of your direct mail pieces for response. Offer customers a choice of response mechanisms and repeat them often. This will greatly increase the probability of rapid response, and cause it to increase exponentially. Adding extra inserts will often lift a response, and adding tangible vouchers with a clear monetary value can boost the response rate considerably, as well. Always, always, always repeat the offer and the expiration date to gently solicit action easily and irresistibly. Successful direct marketers test constantly. Testing pre-roll will always optimize the campaign before it even goes into production for the first run. Thus saving you time, frustration, and money. The responses from your targeted audience will help improve the mail piece and the mailing list, if they are given the opportunity to go through pre-roll testing. Allowing select customers to participate in pre-roll testing, can also greatly increase their sense of loyalty to your brand. Careful oversight of fulfillment and mailing services is crucial. Make sure your documents are proofed and ready before sending to print. Make sure salutation fields and address fields all print properly as the document goes through the merge process. Make sure you supply all of the required data fields when you prep the data. Make sure the number of records you send over is the correct number from your master list. Verify everything. Insist on signing off on proofs, even for variable text merge documents. Demand to see samples with the variable text inserted and in its proper place. Make sure everything is producing and printing properly. Let multiple people proofread. The effectiveness of your direct mail campaign can always be perfected by testing and retesting. True test by making sure all elements other than the ones you are testing remain absolutely constant. Follow scientific protocols and use control groups for every test performed. Timing, message clarity, creative effectiveness, response rate, and other criteria can easily be gauged through testing. Document every statistic and track the variables over multiple test mailings. Do not skip this step. It is imperative that you figure out what is working and what is not. Do not make assumptions. Test it. Measure results accurately and track your success factor-by-factor and campaign by campaign. This is how you will determine the cost per lead and ROI. This will help you budget accordingly for all of your marketing efforts. It pays to know the truth. And don’t ignore the truth. Now that you have tested, evaluated, and executed your successful direct mail plan and enjoyed a very healthy ROI, you have all the tools you will need to confidently and proficiently pre-plan your next campaign. 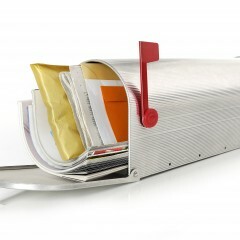 Always remember, direct mail is proactive rather than reactive. Better Letter Mailing Services is ready to help you enjoy many direct mail successes and ultimately help you boost your bottom line. Don’t procrastinate any longer. Get started now! Call Better Letter Mailing Services at 678-565-9388. When you send out direct mail to potential or existing customers, you have the ability to target or personalize it for maximum impact. Targeting and personalization are two of the attributes that attract companies to direct mail as an advertising channel. When you send prospective customers direct mail that relates specifically to their interests or addresses them by name, you are more likely to elicit a positive response. To target your direct mail campaign, you must first understand the attributes of your regular customers. If you have collected information from your existing customers, you can analyze your customer database to find out the traits that your regular customers have in common. This data can include characteristics such as age range, marital status, gender, whether they have children, and so on. By targeting your direct mail campaign at potential customers that share these attributes, you can maximize your chances of winning new business. If you do not hold this information on existing customers, don’t despair. You can begin to build your database by encouraging your customers to share their details with you. Send out a short survey that asks them to provide certain key pieces of information. By offering a discount or free sample in exchange for completed surveys, you can encourage customers to respond. The information provided will be valuable enough to justify this incentive. Customers have become increasingly comfortable sharing information with companies for marketing purposes. In a recent survey conducted by Accenture in the U.S. and U.K., 80% of those who responded said that they believed total privacy is a thing of the past. If it generates targeted offers, 49% of respondents are even comfortable having their behavior tracked. Lazy direct mail campaigns that send the same message out to everyone are unlikely to generate optimal results. However, by taking time to target your direct mail campaign at customers who share the characteristics of existing customers and personalizing your marketing material, you can maximize your chances of generating a healthy return on your investment. Direct mail is a vital part of any marketing campaign. To truly achieve its potential, though, it needs to be designed and used intelligently. You need to know the kind of audiences that it works best with, and the kind of industries that the medium goes well with. Local businesses like fitness centers, day care centers, plumbers, landscapers, real estate agents and florists need a way to reach out to consumers who don’t go online, and also to those who do but haven’t thought about opening marketing emails. Direct mail works very well for them. Direct mail is also an excellent choice for businesses that need to build up their knowledge of the local community. Since recent developments in direct mail technology allow automated tracking in campaigns, it can be a valuable way for these businesses to collect consumer information. While direct mail works very well for every industry, it tends to work particularly well for the healthcare industry and for nonprofits. Healthcare services greatly depend on direct mail. When they need to market healthcare services for consumers with certain conditions that require discretion, direct mail is often the best way. Nonprofits need to elicit an emotional response from their audiences: they need sympathy and contributions. Direct mail tends to be effective in marketing situations that require the ability to touch someone emotionally. In the luxury goods industry, posts in social media, reviews by bloggers and email marketing attempts don’t work as well as they do in other markets. To begin, the vast majority of luxury consumers are not on social media. They also don’t research their purchases online because there isn’t an abundance of high-quality information available. They usually depend on luxury goods magazines, catalogs and high quality brochures. Consumers over 50 are another segment not known to primarily depend on online methods when making buying decisions. Consumers in this group are used to seeking their information through conventional means — word-of-mouth, brochures and television. Direct mail works very well with them. Marketers tend to believe that anyone under 35 is likely to be sufficiently familiar with electronic methods of information gathering to prefer email marketing. Research by marketing research group Epsilon Marketing, though, finds that the 18-35 group prefers to receive its information in print for certain kinds of products. Personal grooming products, food products and home cleaning products tend to work well in print with these audiences. In many markets, consumers expect personalization in the marketing communications they receive. They want more than to have these communications get their names right. They need to see marketers do their homework: to know the kind of equipment they have, their budget, their choices of brand and so on. While email marketing certainly can be personalized in this way, consumers tend to feel that direct mail is more personal than email. Attempts at personalized marketing go over better when it’s direct mail. For marketing communications that include very clear calls to action — a single, specific offer, coupons aimed at specific, well targeted needs and so on — direct mail works very well. When people have a piece of paper in their hands with a simple, clear offer in printed form, they tend to respond very well to it. "Better Letter has provided us with exceptional customer service and attention to detail. We truly value our relationship with Better Letter and look forward to a continued solid partnership." "We have been outsourcing our mailing services to Better Letter for almost fifteen years now. They've always been prompt, knowledgeable, and courteous!!" "I have used Better Letter for Direct Mail programs – Chuck Ekstedt is a straight shooter with to the point answers when I need help with mail." Better Letter Mailing Services, Inc.
© 2015 Better Letter Mailing Services, Inc.